Here we share links to stores selling some of our favourite carriers. The Sling School are delighted to be able to offer our class and library customers a discount on carriers purchased from Natural Connection, Connecta Baby Carriers, and Maverick Baby Please ask for details when you attend a class or borrow a sling from the library. Recommended Websites for information and more! A lively friendly forum for all natural parents. 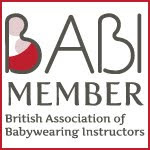 Find A babywearing Consultant near you. Baby carrying resource, for parents, by parents. Find A Sling Meet or Sling Library near you.